Well, what a wild night it was: wind, gales, rain and huge gusts shaking everything. I slept little and was up a little after six to check if we still had our summerhouse, bothy and so on. We have lost a tree which had already suffered during an earlier storm. It is sad, but not nearly as bad as I had expected. I went back to bed and got up just before eight, just as the power went off. So my task was to dig out a generator and set up lighting in the Stables. And this is the day that the television company is coming to film! Having got everything ready, the film folk arrived ... and the power came back on! 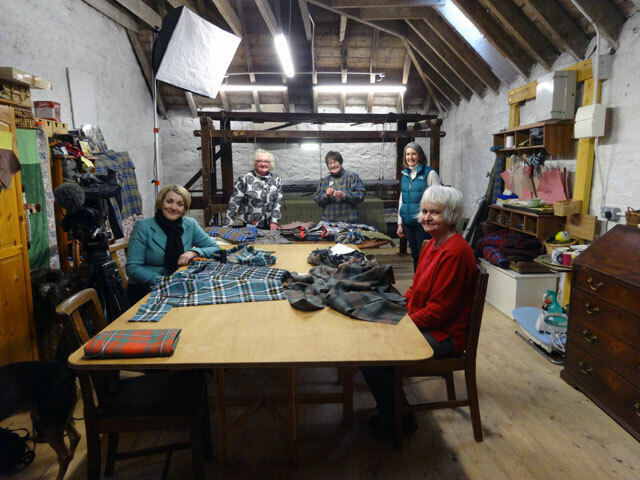 Sandy was here to talk about the loom, and Rachel, Ann and their students Olive and Shona were all filmed and interviewed for a programme called Border Life which will be broadcast on Monday 26th. January at 8 p.m. Several times during the day the power went off and I was glad we had the generator to hand to carry us through. Alison arrived in the afternoon and everything went from strength to strength and after Fiona and Ian, her camera man, left chatter reached a record decibel level. During the day, when not manning the generator, I cleared more clothes to the summer house and did some work on the Presbytery papers in the Bothy – despite the frustration of losing my place on the computer every time the power failed. I have to mention my sorrow at the events in France. Terrorism seems to be everywhere at the moment and there is little doubt that it is only due to the skill of our own counter-terrorism staff that violent outrages have been kept from our streets in recent times. There is a debate to be had about free speech, but not at this moment and nothing ever justifies the brutal murders we have seen in the last three days.